Home  My Gleanings Page  Illustrated Issue - Page 4. Illustrated Issue - Page 4. MARION, KY., THURSDAY, JULY 10, 1902. This issue of the PRESS, while not faultless by any means, is a pretty neat output for the average Kentucky weekly newspaper office. Maps of the county with the geological letters mentioned by Prof. Ulrich in his article on the first page can be obtained at the PRESS office. The cost is ten cents each. Special correspondent LaRue, of the Evening Post, Louisville, in writing of this district says some very pretty things about us and our mines. The spider that spun that cobwebby mining map, however, ought to be indicted and tried before Judge Evans. Some people who will see this issue of the PRESS may perhaps desire certain information that is not given here. Assistant General Freight Agent Harwood, of the Illinois Central Railroad, at Evansville, Indiana, is in touch with and knows the country thoroughly and assures us that he will be pleased to reply to any requests concerning our resources. One looking upon the half tone reproductions of the bright, smiling, guileless faces of the two gentlemanly General Managers that grace the Evening Post's article on "Fluorspar" would at once place them in a class with the cherry tree and hatchet of George Washington's time. Such optimistic views, however, change as the interviews are slowly and carefully digested. The debt of gratitude due to two young men by the people of Crittenden county is a large one. John W. Blue and Clem S. Nunn, to whom our prosperous condition is mainly due, would no doubt disclaim any such indebtedness. Nevertheless without their gallant pluck in the dark days when pluck more than money was necessary, these prosperous times would not now be with us. The suggestion by Mr. F. H. Harwood, the Assistant General Freight Agent of the Illinois Central Railroad, of a belt line touching at all the producing mines and the larger towns such as Dycusburg, Salem, etc., returning via Sheridan and Crittenden Springs would be of inestimable benefit to both our agricultural and mining interests. We hope Mr. Harwood will press the matter to a successful issue. The progress made in and around Marion has been so gradual that many of our citizens fail to recognize the very great change that the past two years has brought about. The amount of money paid for labor every month is fully ten times more than even a year ago, the utter inability of fully two hundred and fifty people to crowd into an already crowded opera house the other evening is a straw that indicates the rapid increase of our population. More than double railroad receipts for freight and passage tickets, the magnificent bank statements published on our third page and the general air of ease and plenty that pervades the entire community simply show we are building wisely and well. Of course as in most new or partially developed countries we have people both selfish and near-sighted. People who cause the eagle bird on a quarter of a dollar extreme pain every time they part with one. Such people are surely worth more to any community when safely landed in heaven than they are on earth. We have in mind several who could be spared in that way much to the advantage of the general public, but for diplomatic reasons we do not publish their names. Old mining men will recall the great dumps of slag in the vicinity of the city of Chihuahua, Mexico, and how it is more or less permeated with native copper, the result of the imperfect smelting in the old Adobe furnaces. Assay after assay has been made of the average of this slag for the purpose of resmelting, and while the value was great enough, the lack of coal and water has been a perpetual drawback. Probably a million tons of this rich slag has been lying in the streets and fields of this Mexican city for a century or more. If the old Mexican Adobe furnaces were the only ones that had produced slag rich in metal or had we attained a formula in making up our smelter charges that always gave us a "lean" slag, then this article had not been written. With all of our supposed advancement in the science of metallurgy we still suffer and suffer very largely from the loss of iron and other metals through the slag exit of the blast furnace. In layman's way we know that the iron blast furnaces are charged with iron ore, limestone, coke and coal. Should the charge be just right the melting zone will consist of a molten liquid thin enough to allow the heavier specific gravity of the iron, the copper or whatever the metal may be to pass down and through this sea of metal into the metal zone of the furnace, the slag being of necessity extremely free from metallic substance. Should the reverse be true as so often happens and the "charges" are not formulated just right, a heavy, slow moving, dense composition is formed which either "freezes" in part and readers [renders] in impossible for a portion of the metal to pass down, the specific gravity of the one being so near alike the other, hence results a slag rich in metal. Salt Lake, Utah, is so heavily impregnated with salt that it is quite impossible for a body to sink under its waters, but dilute this salt with fresh water, or in the language of the metallurgist, flux this Salt lake with fresh water and you then have a liquid so thin that only a good swimmer can keep afloat. It is the same with the hesvy [heavy] sticky combination of ores, limestone and coal resulting from the imperfct [imperfect] charges or rather from the crude fluxing material that is in use in about all of our blast furnaces. Let the metallurgist whose business it is to decide upon the proportions of ore, fluxes and coal in the charge, add to his limestone a portion of fluorspar, the quantity of course to be decided upon in his labratory [laboratory] and a liquid will inevitably result thin enough to allow all metallic particles to pass down through to their destined position in the metal pot. In fact such a result is as sure as that the body of a man will sink in fresh water because its specific gravity is greater than the water. The result so far as the slag is concerned can be predicted, it will not contain metal. The blast furnace people are the only producers of metals other than zinc who do not make of fluorspar a part and portion of their furnace requirements. Fluorspar is one of the most active, the strongest fluxing mineral known. It is as regularly used in all of our open hearth steel plants as is coke and coal. Many blast furnaces have added it recently much to their advantage as its use gives an extra heat every twelve hours and its slag is as lean as a bit of limestone. Crittenden county has other products besides its minerals, that is extending its acquaintance and making favorable impressions abroad. Among the factors that are giving us prominence is the name and fame of our distinguished fellow-citizen whose picture appears in this issue. Is handed down from sire to son. Marion F. Pogue is a native of Crittenden county; he is one of our most successful and popular teachers. He is also engaged in merchandising and has a prosperous business at Frances. He has also taken an active interest in politics. Last year he was elected to the Legislature, serving the two counties of Crittenden and Livingston with distinction and honor. In politics he is an ardent Democrat, and his party and country will have more work for him. The son of Judge J. 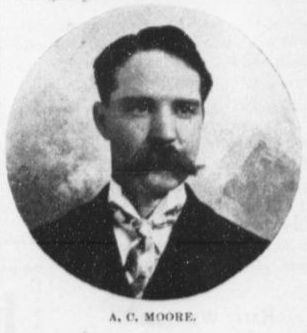 A. Moore, he inherits his father's love of the profession to which he has devoted his life and talents. A native of Crittenden county, thirty-eight years of age, of prepossessing and distinguished appearance, he makes sad havoc with the preconceived ideas of the twelve good men and true in the jury box, provided, their thoughts of the verdict to be rendered are contrary to his side of the case. 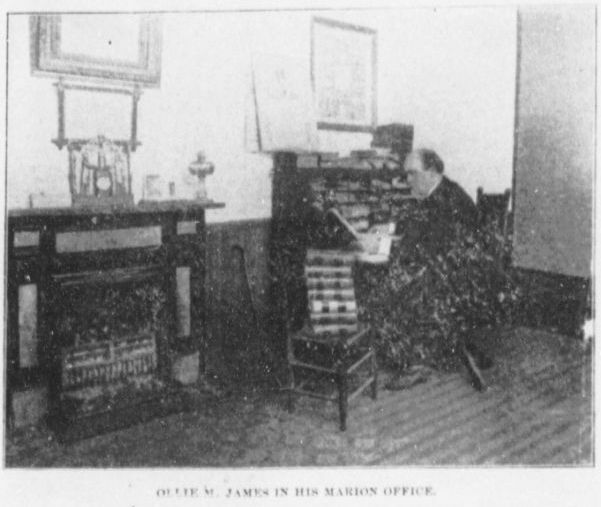 Educated largely in our own high school, supplemented by the Madisonville normal, he placed himself under the directing touch of Judge L. H. James, the eminent lawyer, and was admitted to the bar in 1888. In all of our prominent cases Mr. Moore is usually observed on one side or the other. He has been honored politically several times, County Attorney, Supervisor of the United States Census, with the direct control of over a hundred bright men whose loyalty and good work indicated his directing genius, he now devotes his entire time to his large and lucrative professional practice. 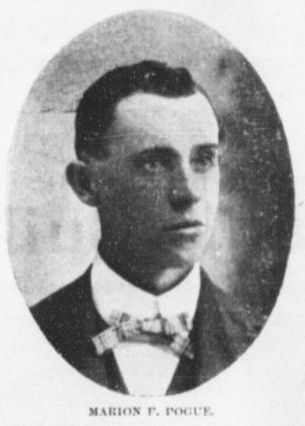 He, in common with most of our enterprising men, is interested in mining, being a shareholder and the vice president of the Crittenden County Zinc, Lead & Spar Company. During the past two years Mr. Cruce has been uniformlly [uniformly] successful in his mining ventures. His field of operations has largely been in Southern Illinois, although he has several interests in this county. Probably the net results in a money way from the sales of mining property and leases will net him for the past few months nearly $30,000. 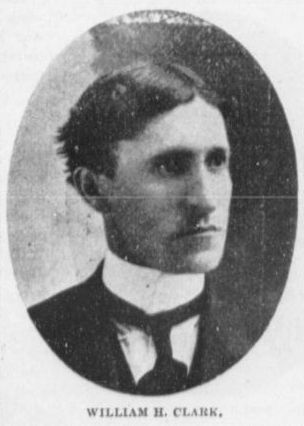 Mr. Cruce graduated from the Vanderbilt University at Nashville in 1882. His five years of successful business life as a druggist in Ft. Worth, Texas, fitted him for the broader sphere which he is now filling. in the prime of life, 42 years of age, kind and generous to a fault, he is one of our typical Kentuckians and one who has a bright future in store. Mr. Clark is one of our younger attorneys. He is twenty-six years of age and a son of Dr. J. R. Clark, of Marion. 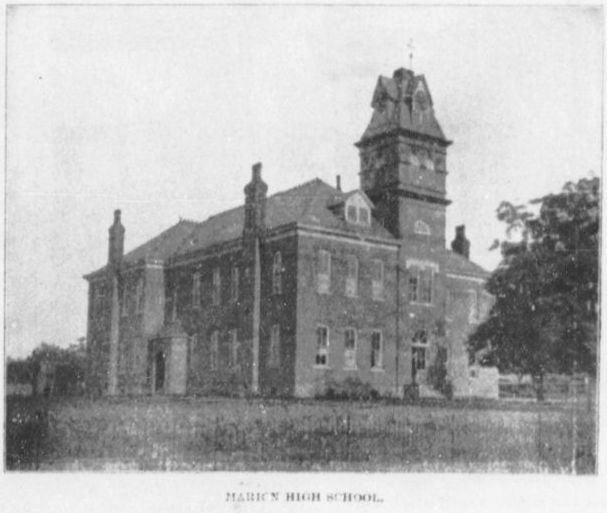 From his graduating class at the Marion High school he passed through the regular course at the Old Centre college, Danville, Ky., and was admitted to the bar in 1899. He is a leader in our social circles, very quick at repartee, a good lawyer and a gentleman. Devoted to his professional practice of the law, city attorney for the past five years, Mr. Moore's experience has been for so young a man--30 years--varied and extensive. 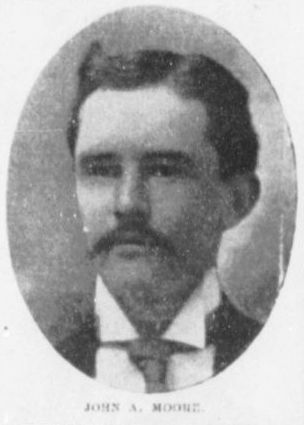 Graduating from the Marion high school in 1890, he was admitted to the bar in 1891, and has since that time been a close student of both men and the law. He is a Crittenden county production in every respect, born, educated and married, and has all the strong loyalty to his town, county, and state that we find in most Kentuckians. Mr. Moore's connection with mining dates back only a twelve month, but in that brief period he has left his mark upon the rocks of his native county. 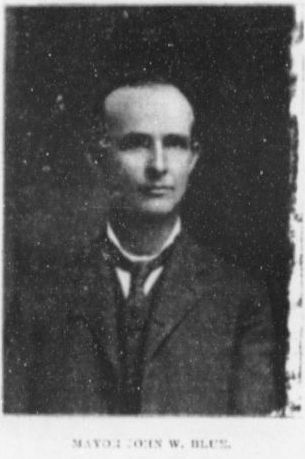 The great educational work that has made the common and high schools of Marion the mecca for the brightest boys and girls of Western Kentucky owes its origin and carrying forward largely to that gentlemanly scholar, Professor Charles Evans. A feature of the school work or rather a supplement to it, is the oratorical contests held annually in which young men and women take part. These contests bring out all that is best and brightest in the students. They are attended by throngs of people; only limited in number to the capacity of the opera house, where these very interesting events take place. Prof. Evans is loyally supported in his educational views by a school board composed of broad, high minded citizens. Two years ago an old newspaper man in Chicago had the good fortune to come across a copy of the CRITTENDEN PRESS containing an article descriptive of a big fluor spar vein in this county. He proceeded, as did the boy who followed the dog which followed the rabbit to the sink hole, on a tour of investigation. His investigations took him to the works of the Illinois Steel Col, and here he found something new, even to a Chicago newspaper man, and the novelty was fluor spar. A few days later he was in Marion, pushing his investigations. 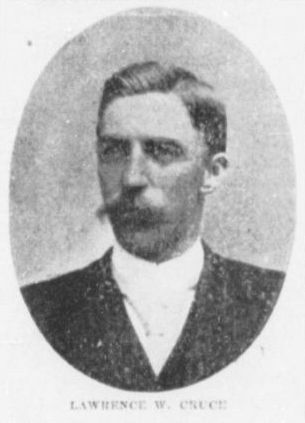 He was favorably impressed with the mining aspect of the country, and having been engaged in the mining business before, he readily made himself acquainted with the district. Its possibilities dawned upon him and his faith in the successful termination of legitimate enterprises grew to such goodly proportions that he remained with us and he is still here. That man is Col. D. C. Roberts. In the developments of the past two years, no man has played a more important part, and the value of his work to the district can not be computed. Capital followed in his wake, and some of the most successful enterprises have resulted. The first piece of zinc ore from "Old Jim" came to his notice; he at once detected its value; took it to Chicago and had it analyzed; with the analysis he visited the principal zinc works of the country and finally interested the Mineral Point people, who are now taking the output of "Old Jim"--the most famous zinc carbonate mine in the country. Besides looking after his mining enterprises, Col. Roberts has been doing valuable work for the PRESS. This issue is, in the main, the fruition of his labor. He is a genial and companionable gentleman, catholic in thought and spirit, cosmopolitan in experience and taste. He has readily adjusted himself to our institutions, and, we are glad, promises to become a permanent citizen of Marion. The Ladies' Club of Marion and Its Objects. This literary club of this city will soon be five years old. It has some uncommon features, one of which is that no formalities were observed in its beginning or have entered into it for many years. No constitution or bylaws were ever adopted, no conditions required for membership, no fees ever collected. Mutual tastes, a desire for mental enjoyment and improvement and a love of good literature, have been the forces that have held a number of busy women, all possessing home cares and duties in abundance, so closely together that "Summer's heat and Winter's cold" have not been able to weaken their enthusiasm. Once a week or twice a month, the members have met at each other's homes to spend a few hours with the great and good ones of the past. At these sessions every incident that is or has been of late transpiring upon our busy world, finds some one to bring it before the members and a discussion, which is necessarily brief, follows. Current [illegible] are always the first things discussed. Good fiction is one item of the regular "bill of fare." Rare poems are read and recited, and the "immortal [illegible]ill" has his day at stated intervals. During the past year the ladies have taken up a regular course of study, following the lines laid down in the Chataqua [Chautauqua] plan. The best thing that has been engendered by the club, however, is the personal sympathy that has ensued among the members. It has been the means of lifting them into a higher and purer atmosphere, and they will cherish it and keep it living for that, as well as other good it has wrought. Recently its members have been considering the feesibility [feasibility] of joining the Federation of Clubs. To do this, however, the club must have an avowed object in view, or an undertaking in regard to the disposition of any funds that may come into its possession. 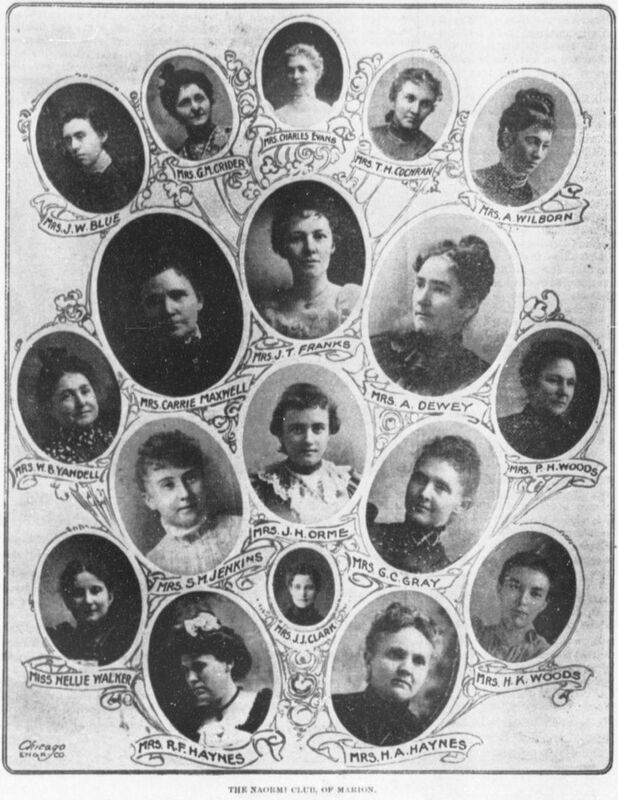 to facilitate matters, a regular set of officers were duly elected, consisting of president, vice-president, secretary and treasurer, a decision reached in regard to moneys in trust, and, at no distant day, it is likely the club will be found knocking for admission at the door of the "State Federation of Clubs for Women." Source: Crittenden Press. (Marion, Ky.) 1879-1907, July 10, 1902, Image 5 - Chronicling America - The Library of Congress.